The name Sanhedrin will not fail to ring a bell with those who are familiar with the Gospels – either because of their religious upbringing or inclination, or for reasons of historical interest – as the name indicates the supreme court of ancient Israel by which Jesus Christ was tried. Though there are also three extreme metal outfits bearing the same name, this particular band (unlike the others, and like the original institution) hails from Israel, a country whose contribution to the progressive rock scene has been steadily growing – especially in terms of quality – over the past few years. Originally formed by brothers Sagi and Aviv Barness as a Camel tribute band, Sanhedrin soon started writing their own material, influenced by the golden era of progressive rock. After going through the usual turmoil of line-up changes, in 2006 they started recording their debut album. Four years in the making, Ever After was mixed and mastered by renowned Israeli sound engineer and producer Udi Koomran, and completed in 2010 – to be released in February 2011 as on the Fading Records division of Italian label AltrOck Productions. The musical connection between Sanhedrin and Camel will soon become evident even to a first-time listener. Andy Latimer’s crew, even if not as hugely influential on the younger generations of prog bands as the likes of Genesis, Yes or ELP, have clearly been a source of inspiration for many outfits who choose a more melodic direction while avoiding the excess of bombast that occasionally characterizes symphonic prog. Even if Camel have sometimes been rather unkindly indicted of being purveyors of ‘elevator prog’, or just a second-tier band lacking the clout of the bigger-name acts, it is undeniable that their restrained elegance has won over a lot of fans. While Ever After may not be the most original album released in the past few months or so, it is definitely not overtly derivative – at least not as much as other albums which I have recently heard, and which are quite highly rated. Fading Records has been created for albums with a more traditional prog bent than the material usually issued by AltrOck Productions, and their first release, Ciccada’s A Child in the Mirror, was a stunning example of ‘retro-prog’ that managed not to sound like a carbon copy of the great Seventies bands. Ever After is much in the same vein, a classy product performed with impressive technical skill, yet exuding a sense of warmth and pastoral beauty that makes listening a genuinely enjoyable experience. While Camel are obviously the most relevant influence, on numerous occasions Pink Floyd (especially their early Seventies output) spring to mind, and echoes of early Genesis can also be detected. 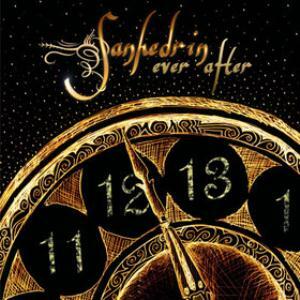 However, Sanhedrin also bring their own signature to the table: the ethnic references subtly scattered throughout the album (not just Middle Eastern, but also Celtic and central European) remind the listener of Israel’s multicultural milieu. Like Camel, the basic combination of guitar-bass-drums-keyboards is enhanced by the exquisitely soothing sound of the flute, with additional woodwinds also employed to add depth and dimension. Unlike the English band, though, Sanhedrin have opted for an exclusively instrumental format, which is quite an interesting choice, and a deviation from the standard symphonic tradition, where vocals play a rather important role. As Israel is part of the Mediterranean region, it is not surprising to find echoes of vintage Italian prog right from the opening track, appropriately called “Ouverture”, together with a nice pinch of Middle Eastern spicing and jazzy touches. The 3-minute number sets the album’s mood very effectively, with its beautifully clear guitar tone, gentle flute and airy keyboards, the various sections flowing seamlessly into each other. The nearly 12-minute ”Il Tredici”, the longest track on the album (which runs at a very sensible 51 minutes), brings the Camel and Pink Floyd influences together in a majestic slice of gently melancholy symphonic prog, with magnificent Latimer- and Gilmour-inspired guitar leads and layers of keyboards. In spite of its slightly macabre title (suggested by the faint recorded sounds of an angry mob heard throughout the piece), “The Guillotine” alternates atmospheric, almost meditative moments with brisker ones driven along by organ and march-like drumming. More ethnic influences emerge in the first half of “Dark Age”, possibly the highlight of the whole album, dedicated to fellow Israeli musician Arik Hayat of Sympozion, who committed suicide at the end of 2008. The lively, Celtic-tinged tune, described by lilting mandolin and flute, reminded me of some instances of Italian ‘minstrel’ Angelo Branduardi’s output, while the somber, organ-dominated mood of the middle section lifts towards the end, with a slightly dissonant passage suggestive of King Crimson. “Sobriety”, true to its title, merges the Celtic flavour of its flute-and-drum opening with the spacey yet majestic tone of Pink Floyd circa A Saucerful of Secrets (clearly referenced in a particular organ passage), and an intricate ending that brings martial drums and sharp, clear guitar to the fore. While “Timepiece” adds some almost tentative bouts of heavier riffing to a framework that combines the pastoral feel of Camel with the atmospheric mood of Pink Floyd, closing track “Steam” (introduced by the short acoustic interlude of “Tema”) explores definitely heavier territory, especially in its second half, where the assertive tone of the guitar and the subtle shifts in tempo commanded by bass and drums seem to suggest a running train; the electric piano section in the middle brought instead to my mind Ray Manzarek’s stunning performance in The Doors’ iconic “Riders on the Storm”. While, as the previous paragraphs make it abundantly clear, Ever After may not be the most innovative proposition on the current prog scene, it is an album whose every note spells class and a deep love of the musical craft. A thoroughly enjoyable listen, highly recommended to fans of classic symphonic prog, especially those who lean more towards the instrumental side of things, it is an excellent debut from an equally excellent new band. Excellent review for a very good album !